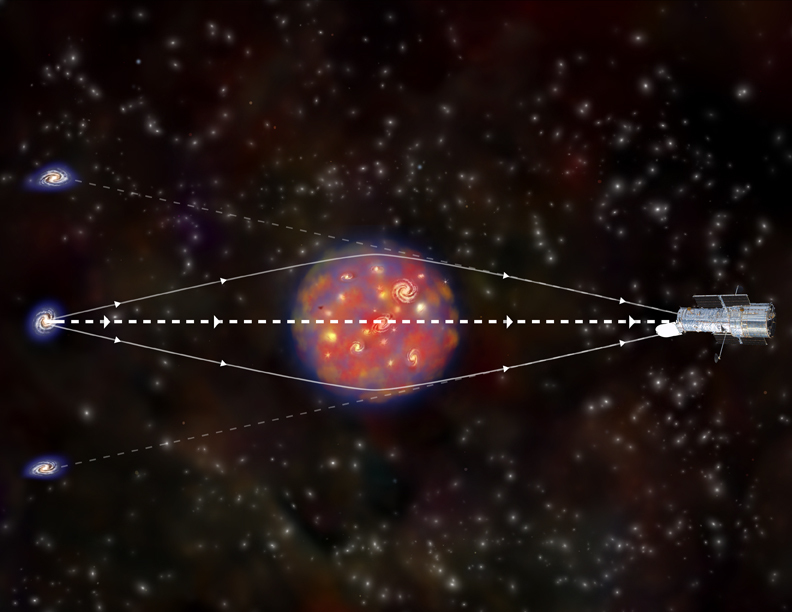 This illustration explains how gravitational lensing, a prediction of Einstein's theory of general relativity, can be used to determine the location of mass in a galaxy cluster. Gravity from mass in the galaxy cluster distorts light from background galaxies. 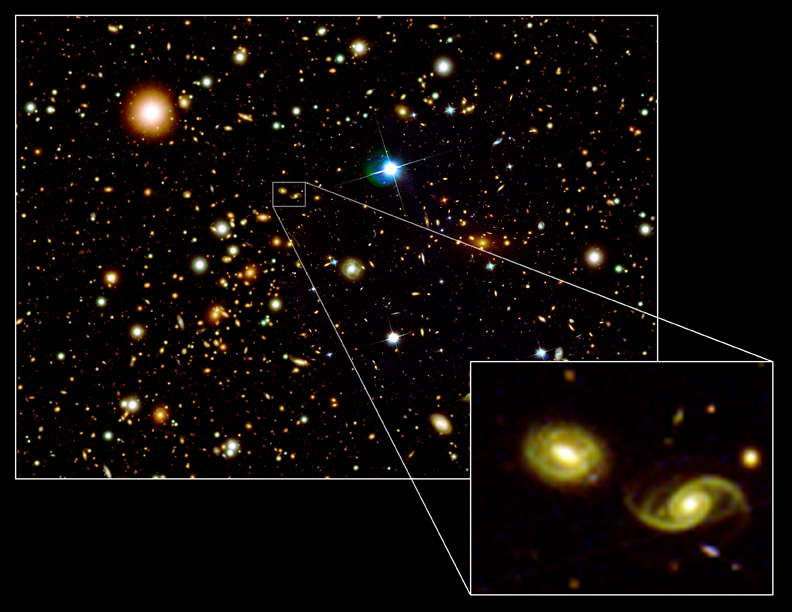 In the idealized case shown here, two distorted images of one background galaxy are seen above and below the real location of the galaxy. By looking at the shapes of many different background galaxies, it is possible to make a map showing where the gravity and therefore the mass in the cluster is located. This is an excellent technique for studying dark matter. These images show the galaxy cluster 1E 0657-56, also known as the bullet cluster. The optical image from Magellan and HST shows galaxies in orange and white. 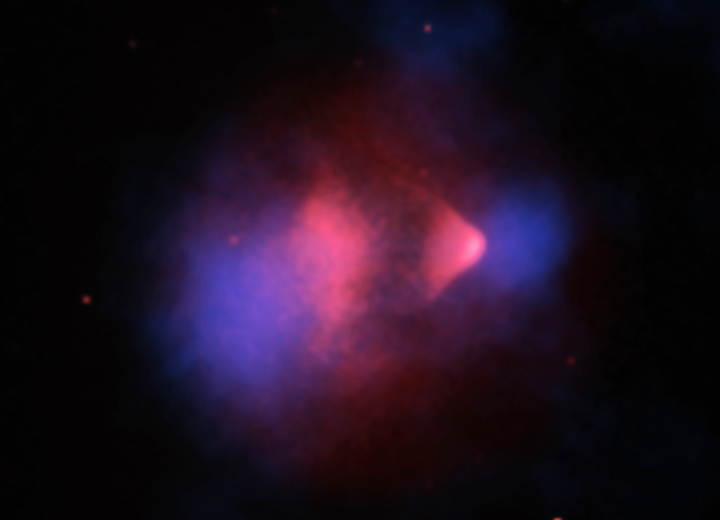 Hot gas in the cluster, which contains the bulk of the normal matter in the cluster, is shown by the Chandra X-ray Observatory image in pink. 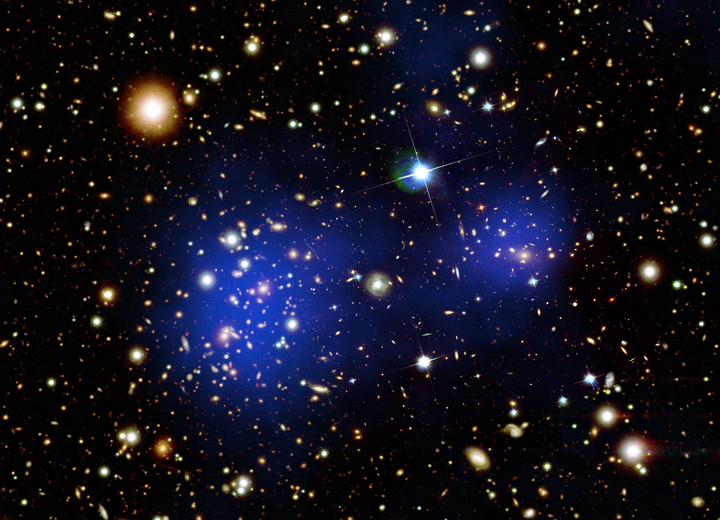 Most of the mass in the cluster is shown in blue, as measured by gravitational lensing, the distortion of background images by mass in the cluster. 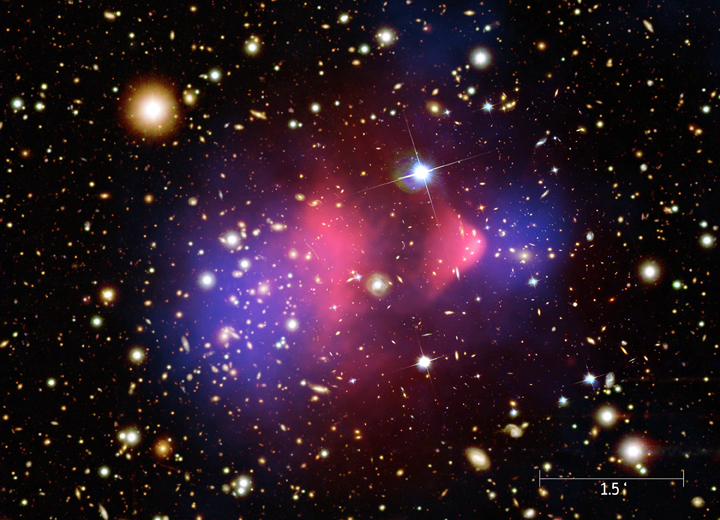 This mass is dominated by dark matter. The clear separation between normal matter and dark matter has not been seen before and gives the strongest evidence yet that most of the matter in the Universe is dark. 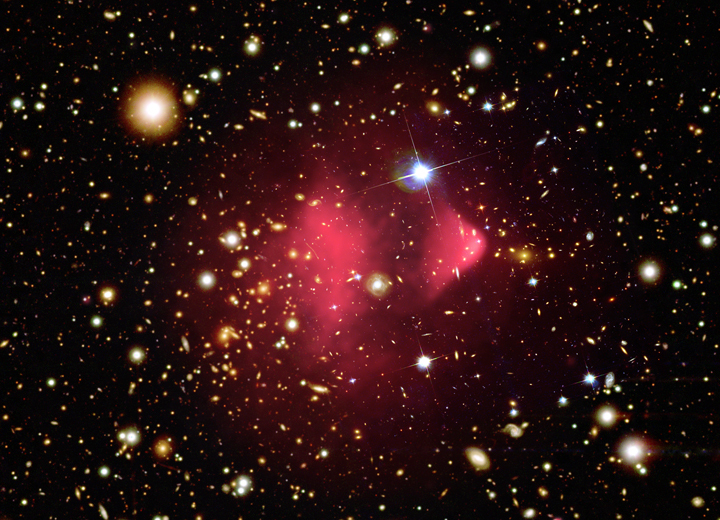 Dark matter and normal matter have been wrenched apart by the tremendous collision of two large clusters of galaxies. Never previously seen, this discovery, made with NASA's Chandra X-ray Observatory and other telescopes, gives direct evidence for the existence of dark matter. This optical image from Hubble and Magellan shows a close-up (inset) of one of the galaxies, a spiral galaxy approximately the same size as the Milky Way, within the galaxy cluster known as 1E 0657-56. 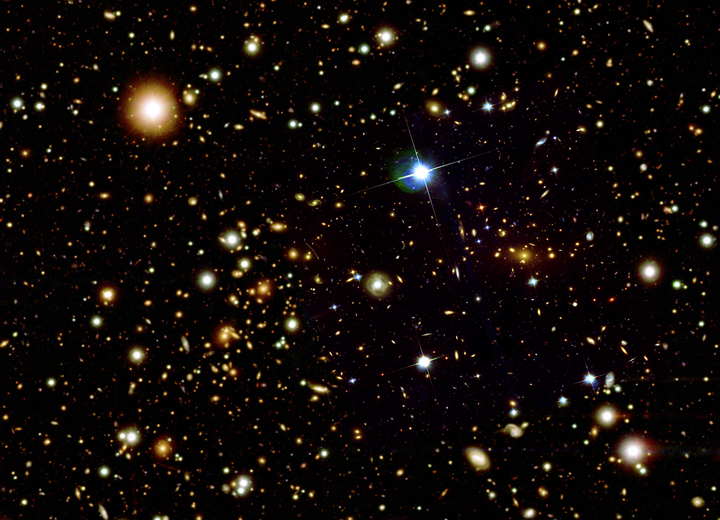 The full-field view shows over a thousand galaxies in this cluster. These immense objects are among the largest structures in the Universe. 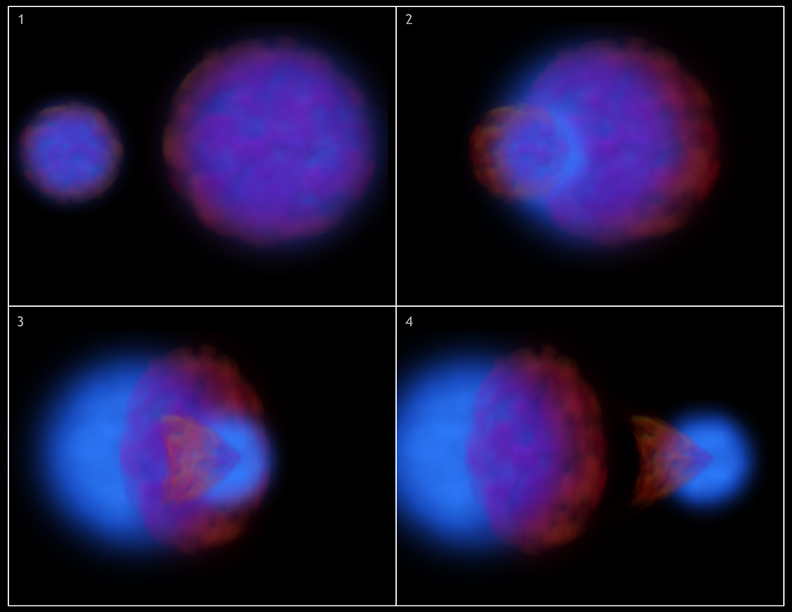 These stills show four stages from an artist's representation of the huge collision that is taking place in the bullet cluster. 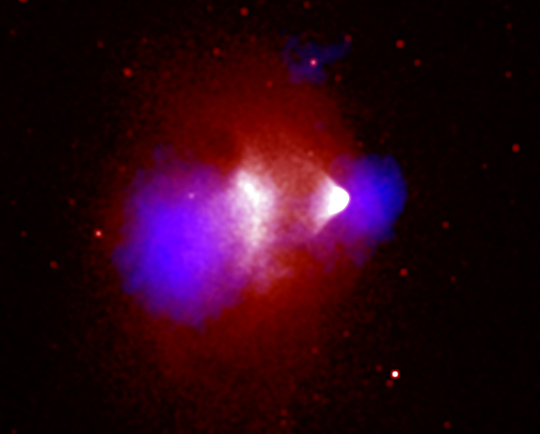 Hot gas, containing most of the normal matter in the cluster, is shown in red and dark matter is shown in blue. During the collision the hot gas in each cluster is slowed and distorted by a drag force, similar to air resistance. 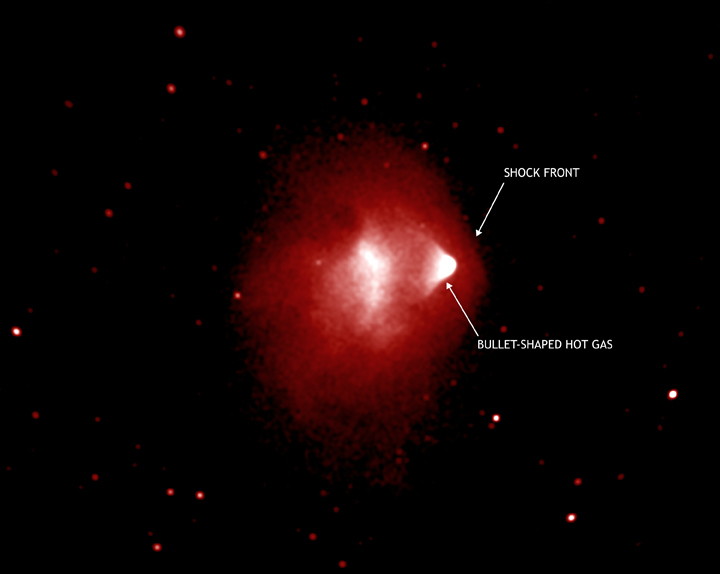 A bullet-shaped cloud of gas forms in one of the clusters. In contrast, the dark matter is not slowed by the impact because it does not interact directly with itself or the gas except through gravity. 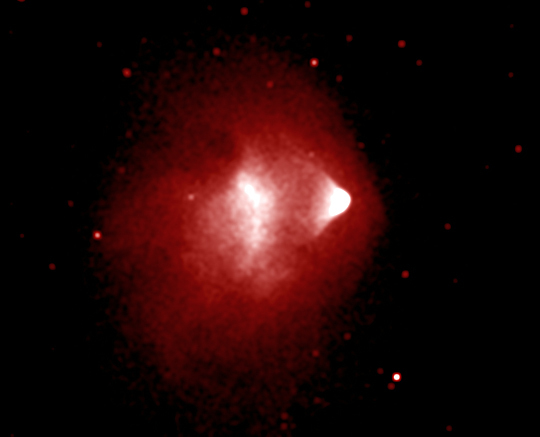 Therefore, the dark matter clumps from the two clusters move ahead of the hot gas, producing the separation of the dark and normal matter seen in the image.